As a parent--and as a teacher--I wonder how much exposure to technology is a good thing. I teach in a 1:1 classroom. My students spend most--if not all--of a daily 90-minute block interacting with their computers or watching a screen where I demonstrate activities on mine. My sons aren't in 1:1 classes, but they spend plenty of time on what I call "screens:" cell phone, iPod, computer, video game/TV. I teach with technology because I believe it can be a key to learning. That's one of the reasons why I provide it for my daughter and my two sons, too. The Organization for Economic Co-operation and Development (OECD) partnered with PISA this month to release a report on students' use of technology around the world. The report traced students' use of technology and found some surprising correlations. Based on a survey that accompanied the 2012 PISA test for 15-year-olds, the study found that 71% of teens worldwide had access to the Internet during the day. The OECD average was 130 minutes on the Internet, ranging from highs of over 180 minutes in Denmark, Sweden and Australia to lows of 50-60 minutes in Korea, Shanghai and Turkey. 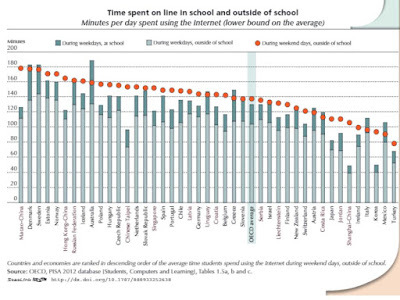 Of these 130 minutes online, only about 25 minutes a day were spent on school-based learning. Image from the linked report. 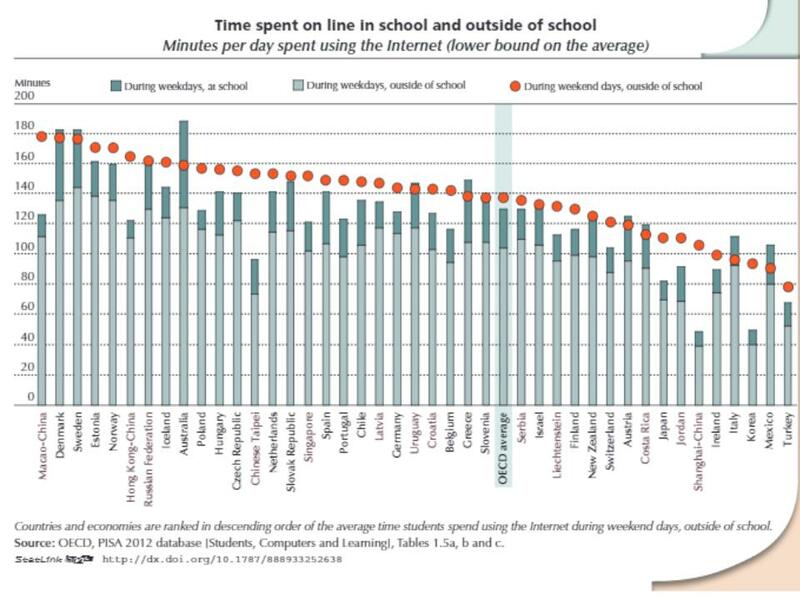 Among those surveyed by PISA, about 7% reported six hours or more of daily Internet use. More than 13% of teens in Sweden and Russia reported such a high degree of online interaction. The Internet is having an effect. It's interesting to note that two of the highest-scoring countries on PISA--Korea and China-Shanghai--have the lowest usage of the Internet among teens. The concern for parents is with students' social development. The way to help kids fit in may have more to do with getting them to church and community events and less to do with providing them with screens.